The Chado Kaikan is a two-story building located across the street from the Kabutomon entrance gate to the historical Konnichian tearoom complex. It was designed by the 14th generation grand master, Tantansai, and his wife, Kayoko, and was completed in 1956. 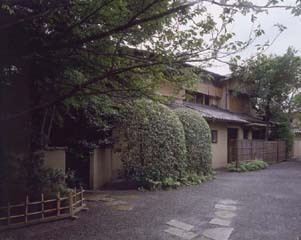 On the first floor are three tearooms - the Shinka, "Flower of the Heart"; Houn, "Phoenix Cloud"; and Kasho, "Auspicious Pine" - which were given their names by Prince Takamatsu. There is also a ryurei room, for serving tea using tables and chairs. All of these open onto beautiful gardens. 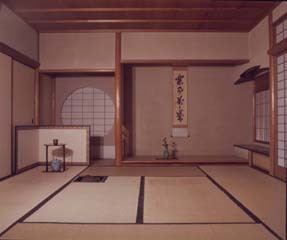 On the second story is a large tatami-floored room with a stage. Besides its use for regular lessons, this is the main site for the intensive seminars held quarterly, and it is also used for many other functions.